Submitted by dave on January 29, 2007 - 3:29pm. MONTANA OVERRUN WITH BANDS OF LAWLESS MEN. AN ERUPTION OF VIOLENCE WHICH THE VIGILANCE COMMITTEES ARE TREATING WITH PLENTIFUL DOSES OF HEMP. MILES CITY, Montana, Dec. 1. -- Never since the dark days of 1863-4 has Montana been so overrun with horse thieves, road agents, and other bad characters as at the present time. Both whites and reds have taken a hand at the business, as though endeavoring to see which could outdo the other in deeds of villainy and acts of crime. As it stands both parties are about even, with no back counties to hear from. The first act of violence this year was committed May 15, near Glendive, by a well organized band of road agents, who made a murderous attack on Major Whipple, a regular army Paymaster, in the hope of securing some $18,000 or $20,000 which that officer was carrying to pay off the troops at Fort Buford. The scheme failed, owing to the fact that the mules became frightened at the rapid firing and ran away with the ambulance in which the funds were being transported. A brave soldier, however, was killed, Sergt. Aquila Coorod, and two others were badly wounded. At about the same time Con Murphy, the notorious road agent, made his escape from the Deer Lodge Penitentiary, where he had been incarcerated for several years, and commenced operations in the western part of the Territory. On May 26 he made a bold attempt to “hold up” the Benton coach, near Mitchell’s ranch, on which occasion passengers were robbed in broad daylight. His partner, George Munn, was detailed to go over into Idaho and make a raid on Ricks’s ranch, and get what money he could. Ricks was a wealthy cattleman and had a great deal of ready cash on his premises. Ricks, however, was fully prepared for the attack, and when the highwaymen came in sight Ricks, with 18 or 20 cowboys at his back, rode boldly forth to meet them, and “smote” the robber chieftain dead in his tracks and put his band to flight. Murphy was captured a few weeks later and lodged in the jail at Helena, where it was supposed he would be secure, but on the night of July 21, he broke jail, through the aid of confederates, and is now at liberty. He was assisted materially in regaining his freedom by the kind consideration of Sheriff Gilpatrick, and his watchmen, who, on the evening in question, were interested spectators of a prize fight at the Academy of Music. While the Sheriff and his aides were looking at the scientific display of the manly art, their prisoner, whom they left shackled, had gotten rid of his irons, and was making his escape through a hole in the ceiling of his cell. Con Murphy, at the present writing, is on an island in the Missouri River, 25 miles from Helena, with a band of 20 desperate outlaws around him. He is in a position to defy 500 armed men, and is so confident of his safety that he has made no effort to get out of the country. Recruits are constantly joining him, and he is no doubt preparing to carry on a system of depredation and plunder the like of which has never been heard of before in the Northwest. Personally, Murphy is a brave man. While being brought from Helena to Butte when last arrested, although manacled and handcuffed at the time, he boldly jumped from a Utah and Northern train while traveling at a speed of 20 miles an hour. The train was stopped and the outlaw recaptured without difficulty. Reuben Black with his wife and daughter. 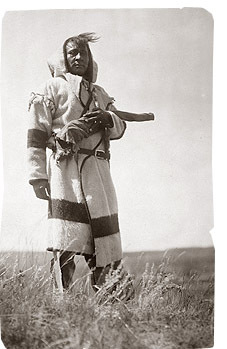 The photos of Piegan natives illustrating this article were taken by Edward S. Curtis in Montana almost 100 years ago. Inset above: Piegan scout; inset below: Mike Shortman. On the Fourth of July two desperadoes named respectively “Rattlesnake Jake” and his partner, Steve O’Fallon, made a descent on the little village of Cottonwood, in the Dog Den Mountains, with the avowed intention of cleaning out the town. They rode up to the open doorway of T. C. Power’s store and began firing into the crowd inside without any warning whatever. The citizens of the town were soon drawn into the fight, and before many minutes had passed O’Fallon fell with five shots in his body. While in the last agonies of death he raised himself upon his knees, and, taking deliberate aim with his Winchester at a young man named Smith, (an outsider who was trying to get away from the fracas,) shot him through the head, killing him instantly. “Rattlesnake Jake” took nine balls in his body before he yielded up the ghost. Early in the Summer there was a grand revival of horse stealing all over Montana. It grew so rapidly in favor, and has been participated in by so many people of late, that it may be truly classed at present among the prominent industries of the Territory. Up to within a few weeks there was, between the Muscle Shell and Judith Rivers, the most daring and powerful band of horse and cattle thieves, regularly organized and captained, that has ever existed in the Northwest. The numerous depredations and outrages committed by this band (numbering over one hundred) at last called for the speedy organization of safety and vigilance committees. Cattlemen, stock growers, and sheep raisers went at the thing in a business-like way. From each round-up party a number of cowboys was detailed, under fearless leaders, to scour certain sections of the country, and when a nest was found to clean out the same in short order. Deputy Sheriffs and their posses were voted no good. They have been tried and found to be wanting. A funny little incident happened to one Vigilance Committee. This particular committee was under the leadership of Randolph Keen, and on July 25 found itself hot on the trail of a company of horse thieves which had been running off stock in the vicinity of Billings. Mr. Keen traced the thieves from Parks’s ranch to the Bull Mountains, where they turned south toward the Yellowstone, on reaching which they again changed their course and rode down stream in the direction of Miles City. The robbers then suddenly left the river and struck off north toward the Muscle Shell, when, finding themselves in a country thickly populated with cowboys, they became frightened and hastened away toward Fort Maginnis. The small party of determined men followed hot on their trail, and soon after crossing the Muscle Shell River was received by the thieves in a very warm manner. The pursuing party, after leaving the river, came to a knoll or rise in the prairie, from whence a good view of the surrounding country was had. While Mr. Keen was in the act of scanning with a field glass a small bunch of trees not far ahead, and a little to the right, a shot was fired from the spot, and the bullet crashed through the glass shattering it to atoms: Although Mr. Keen escaped without injury of any kind, yet he afterward said he was never so much astonished in all his life. He actually saw the puff of smoke through his glass, and was intently watching the shot while the bullet was speeding toward him. Although the various Vigilance Committees have been industriously at work ever since mid-summer breaking up the bands when cornered, and hanging every horse thief they could lay their hands on, it seems almost impossible to rid the country of these pests. There has been a great deal of hanging in the northern country during the past season, and no one will ever know who or how many have gone to their death through the courtesy of the vigilantes or cowboys. Every little while information is brought in that “another horse thief has been set to stretching hemp.” Hunting parties out after buffalo, antelope, and other game report the finding of a human body every once in a while swinging from a cottonwood tree in some lonely spot. Altogether, from trustworthy sources, it is known that close on a hundred outlaws have been strung up by the different Vigilance Committees who have been at work this season, and the job is not half finished yet. They have been driven across the international boundary line into British Manitoba; also over into Idaho, and south into Wyoming. Among those who fled into Wyoming was the notorious “Windy” Campbell and his gang, who had been working successfully for some months in the Muscle Shell country. This rascal succeeded in carrying all of his stolen horses with him, and on his way south arranged it so as to pass through the Yellowstone National Park, where he managed to pick up a few more horses as well as a few watches, purses, and other valuable property from tourists who had come to view the wonderful geysers. 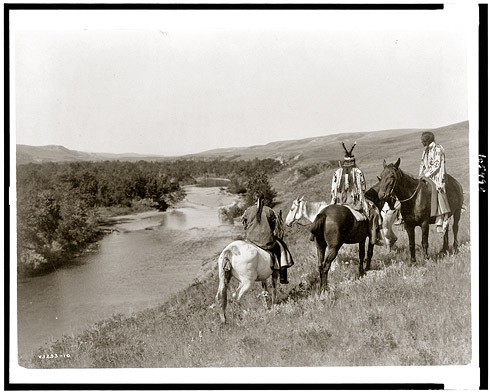 Piegan riders in Montana circa 1910. There is at present a large band of cowboys out on the warpath north of the Missouri River. They number 60 in all, and are under the leadership of a half breed named Coutrielle, alias “Flopping Bill.” “Flopping Bill” and his party, from last reports, are making the lives of the horse-stealing fraternity of the upper country a wild and terrible uncertainty. There is a rumor afloat that the National Government is going to take a hand in suppressing horse thieving in Montana, if the vigilantes leave any of them for Federal action. With all due respect to the authorities of the Government who contemplate such action, it were better to leave the vigilantes alone in their work. The cowboys’ lariats will prove much more effective in suppressing horse thieves than government red tape. 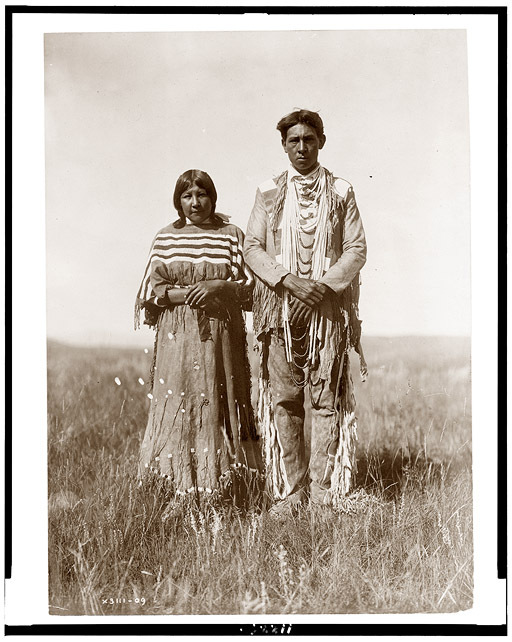 Joe Russell and his wife. The Crows are the wealthiest Indians in the whole Northwest, while the Piegans, miserable, half-starved creatures, are the poorest. The latter tribe has been in a terrible condition for a year past, the mortality at one time averaging over 30 deaths a month, and all due to starvation and nothing else. In consequence of which the Piegans, unable to obtain food from the Government, first eat up all their own ponies and then drew supplies wherever they could get them. They made one raid after another on the Crows, who in return raided the Piegans. Of course, while hot after each other’s horses and scalps, whenever a well stocked ranch belonging to some industrious white settler was run upon, the ranchman would wake up in the morning and find all of his horses gone. The Crows said the Piegans did it, and the Piegans said the Crows did it. As a matter of fact, both did it. 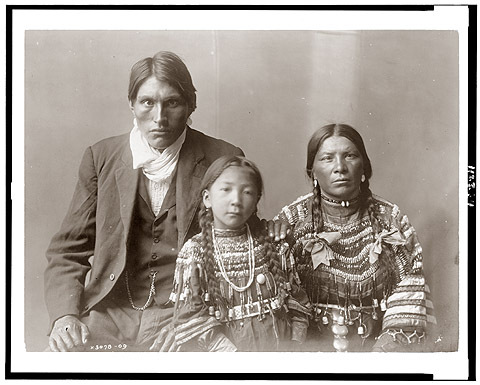 On Nov. 4 it was discovered that the immense Crow reservation had been used as a harbor for horse thieves, both white and red. Between 300 and 400 stolen horses were found in the Black CaÃ±on of the Big Horn Mountains, where the animals had been cached for some months. Nearly all of them bore the brands of ranchers who have lost stock. 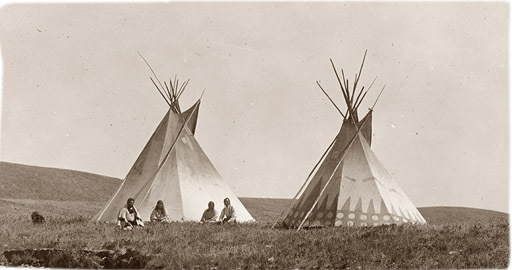 It has just come to light also that the Piegan reservation has been used for the same purpose. Nearly 2,000 head of horses have been found near the Piegan Agency under the charge of Piegan braves, who were herding the same. When charged with this rascality the Piegans acknowledged the corn, but solemnly declared them to be Crow ponies which they had captured from their enemies in battle. As it happens, most of the horses are branded, and the brands are unmistakably those of ranchmen and settlers on the Upper Teton, Marias, Muscle Shell, and other streams. 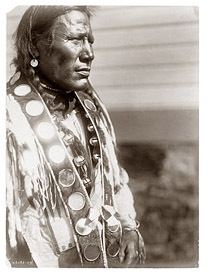 Those most interested have appealed to the Indian Agent to regulate the matter, and unless he complies it is very probable that some of the Vigilance Committees now working the country will pay a visit to the Piegan reservation some dark night, recapture the stolen stock, and treat these red horse thieves, who are no better than the white ones, to a wholesale hanging.